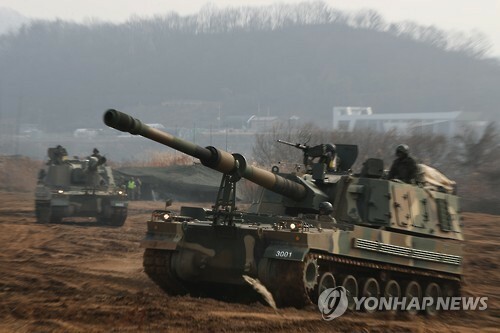 South Korea will deliver 48 of its K9 self-propelled howitzers to Finland, the country's defense procurement agency said Tuesday. The Finnish government has recently approved the purchase of the 155mm howitzer systems from South Korea citing price competitiveness and overall capabilities, a spokesman for the Defense Acquisition Program Administration said. The contract is estimated to be worth 178 billion won ($155 million). "The delivery of the K9s is due to begin this year and be completed by 2024. Finnish troops are scheduled to be trained on the K9 from 2019," the DAPA official said, confirming a foreign news report on the deal. The timeline is in line with Finnish plans to declare the initial operation of the new howitzer in 2020 with full deployment in 2025, according to an article in IHS Jane's Defense Weekly. "Purchasing the K9 will enable Finland to phase out the majority of its old Soviet-designed artillery systems," the weekly said.